In the UK the pedestrian has right of way on a zebra crossing. Over here drivers are very considerate and on a zebra crossing, they always stop for pedestrians who are waiting on the pavement to cross the road. 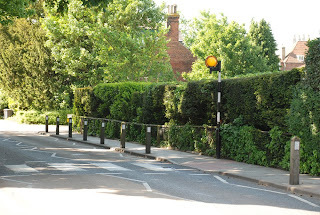 The large globe on each side of the crossing is a flashing light to warn vehicles about the zebra crossing. Well...that's very nice of them. You won't see this in Romania. 100 days left until I'll be there. Drivers are usually pretty good about noticing pedestrian crossings here too, where they also have the right of way. At some of the most busy highway crossings in some towns, they have installed flashing cats-eye type lights right in the asphalt which engage with the crossing permission light for the walker. But where we have zebra stripes, people rule. I remember the British Weather Report song years ago that included the Zebra crossing in the lyrics. First encountered the Z crossing in the UK and found it to be a most civilized practice. In the USA, in recent years and in some cities (like Seattle) a similar pedestrian right of way in crosswalks has been adopted. However, here the pedestrians view that right of way as, well, an entitlement and more often than not simply step into the roadway without bothering to see if there is a car already rolling through the intersection. And of course, should you happen to flatten one of these non-looking pedestrians you, the car driver, are at fault no matter what. Decidedly not a good thing. Prudence and common sense should cut both ways. The old saying "look before you leap" still makes good sense!